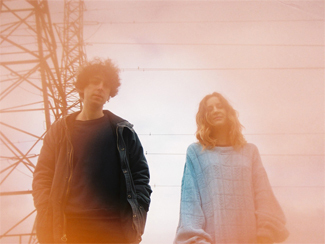 Frank YangAsk around and some may tell you there’s a bit of a psych-rock renaissance happening in the UK right now, pointing to the emergence of London’s Toy, Leeds’ Hookworms, and Kettering’s Temples as examples of new bands embracing the grand tradition of droning, swirling, and tripping out. And while they’ve yet to stage any sort of full-bore, acid-drenched incursion onto North American shores, Wednesday night’s visit from Temples made a good case that we’re ripe for the picking. And if they needed sympathizers amongst the local populace, the openers on this evening would be a good place to start. I’d seen local sextet The Auras back in April and as youngsters are wont to do, they’ve improved immeasurably in that time. If they were looking to shake the very obvious Black Angels reference point, they’ve failed; but if they were aiming to sound more cohesive in aspiring to it, more a tribute band than mixtape, they’ve done well. The songs were tighter, the swapping between lead vocalists and just managing their members and the sounds they make more seamless, and the performance just that much better. 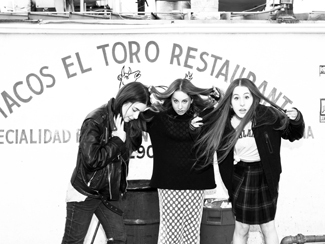 They recorded and released a new EP earlier this year; stream it below. It wasn’t hard to guess where Toronto’s Invasions got their name; they probably dispensed with the “British” because it would have been a little too on-the-nose although they serve their fish & chips with a distinctively t(w)angy American southwest flavour. The five-piece, who just released their self-titled debut, offered compact, punchy tunes with good hooks and swagger given an extra dose of distinctiveness by a saxophone who was sitting in for their usual trumpet. And though the excursions weren’t their raison d’être, there were enough forays into trippiness that those looking to tune in and drop out for the entirety of the evening weren’t jarred. I always consider it a risky move for bands from abroad to undertake a North American tours before they’ve even released a record – not an inexpensive move even for established bands, let alone one trying to convert that unquantifiable thing they call “buzz” into actual asses in seats (or feet on linoleum, in club cases). So with just three singles out in the past year and a full-length debut in Sun Structures just announced as coming out on February 11, Temples’ debut Canadian show was far from a sure success but you wouldn’t have known that if you were there. Even adjusted for the fact that British bands do disproportionately well in Toronto, the club was impressively full with those looking to preview one of the sounds of 2014 and Temples showed up dressed to impress, all fringes, ‘fros, velvet jackets, and glitter, and one pendent just a few millimeters diameter short of a medallion. Based on all this you’d be right to expect a ’60s-vintage hippie-psych soundtrack and Temples do indeed root themselves in the retro, but also allow themselves the gift of ’70s prognostication and imbue their sound with glammy stomps and hard rock riffs. Their set was short at eight songs drawn out over a respectable 45 minutes, and while the already-released material got the biggest cheers, the new songs that previewed their album were the most impressive and exciting because they implied there was more to the band than their fans might be expecting. 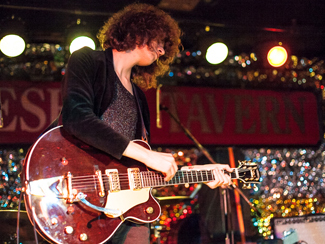 NOW also has a review of the show, and Wicked Local has a conversation with Temples bassist Thomas Warmsley. Yahoo has premiered the video to the title track of Glasvegas’ third album Later… When The TV Turns To Static; the Scots are in town at The Mod Club on February 22. NPR has a World Cafe session with London Grammar while over at The London Evening Standard, frontwoman Hannah Reid comments on sexism in the music industry. The band will return to Toronto for a show at The Phoenix on April 7. Tone Deaf interviews Kate Nash, who lists her favourite television for The Guardian. NPR is streaming a complete live concert from Savages. NPR talks synesthesia with Dev Hynes of Blood Orange. PureVolume has a video featurette from Stornoway documenting the making of their second album Tales From Terra Firma. In conversation with Rolling Stone, Noel Gallagher stomps on, kicks down the stairs, stabs, and pees on any prospect of an Oasis reunion to mark the 20th anniversary of Definitely Maybe next Summer. What: Hayden Desser, beloved Toronto-based singer songwriter of the slow cadence, homespun lyrics, and gravely voice who broke a four-year hiatus this Spring with the release of Us Alone. 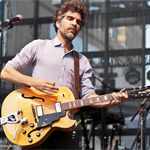 Why: Even though he’s played a lot of shows since the album came out, they’ve largely all been either super-intimate or festivals, nothing that was properly-sized for his audience and just Hayden alone. Until now. How: Tickets for the show are $36.50 in advance but courtesy of LiveNation, I’ve got two pairs of passes to give away for the show. To enter, email me at contests AT chromewaves.net with “I want to see Hayden” in the subject line and your full name in the body. Contest closes at midnight, November 28. Stacey MarkTo say that following the musical career of Dev Hynes is an adventure is rather an understatement. Starting out with the deliberately sophomoric art-punk Test Icicles, he recast himself as an orch-folk troubadour on Falling Off The Lavender Bridge, his 2008 solo album under the Lightspeed Champion name. It was an identity he quickly found himself outgrowing, his second and last record in that guise – 2010’s Life Is Sweet! Nice To Meet You – had its share of high points but felt unfocused, like at a creative crossroads. Focus came with another new identity, Blood Orange, and 2011’s Coastal Grooves – a stripped-down and decidedly solo soul/disco record that sounded made in and for the bedroom that was criminally overlooked. But crucially, while refining and redefining his own artistic identity, Hynes was becoming a highly sought-after producer, particularly after becoming Solange Knowles’ co-writer, producer, and sideman. 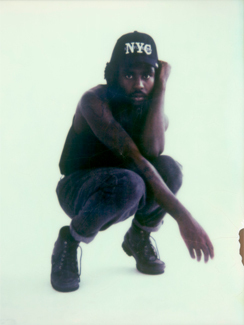 That all-consuming role through most of this year, not to mention his other production duties, made it unclear if he’d be able to return to his own work anytime soon but somehow he still found time to not only record and release his second Blood Orange album Cupid Deluxe, out this week. The most marked difference between Cupid and its predecessor is the sheer number of hands on deck. Coastal Grooves was entirely Hynes’ show, a fact emphatically made by his live shows – but Cupid finds Hynes more than happy to be allowing the likes of Chairlift’s Caroline Polachek, Friends’ Samantha Urbani, Dirty Projectors’ David Longstreth from his indie rock world and Despot, Skepta, and Clams Casino from his hip-hop world take centre stage while he remains the producer and songwriter running the show. And that show is akin to a dazzlingly diverse r&b revue built around themes of both alienation and community in New York City, coupling heartfelt sentiment to slick grooves. Dev Hynes has been making music now for almost a decade, and what in isolation might seem like random and disparate creative shifts, when viewed as a whole, paint the picture of an impressively complex and immensely talented artist. Cupid Deluxe is, thus far, the most cohesive assemblage of his gifts – ironic, since it overtly showcases him the least. I personally would have liked to have his guitarwork given a little more prominence – the man can shred, as anyone who’s ever seen him live can attest – but for the time being, the brilliant missed riff key change at 2:43 of “Uncle ACE” will keep me going. Hynes talks influences with The New York Times and is the cover feature of The Fader, for whom he’s also assembled hour-long mixtape containing new material. But if you’re waiting on tour dates to support the new record, don’t hold your breath. Noisey has premiered the video for the title track of Rose Elinor Dougall’s new EP Future Vanishes, out officially this week. NME has got the new video from Beady Eye, taken from their second album BE which is apparently getting a North American release this week because North Americans have been clamouring for it…? Rolling Stone is streaming another new song from Kele’s forthcoming Heartbreaker solo EP, out November 25. The Guardian and Drowned In Sound talk to Welsh singer-songwriter Cate Le Bon; she’s in town at The Drake Underground on January 21. NME has details on the new album from Maxïmo Park, entitled Too Much Information and due out February 3. They’ve released a video for the first single, which you can also download in exchange for an email address from their website. Fanfarlo have announced details of their third studio album: Let’s Go Extinct will be out February 10, and of course there’s a trailer. The Guardian talks to Lily Allen about her impending return to music with a separate piece about the brouhaha surrounding her comeback video. Anna Calvi lists off ten life-changing albums for MusicRadar. Metro has an interview with M.I.A., who has released a new video from her latest, Matangi. Consequence Of Sound interviews Charli XCX. Little Boots has made a couple of extended edits of songs from Nocturnes available to download via HungerTV. Franz Ferdinand salute Australia with a cover of The Go-Betweens in a video session for Triple J. They’ve also released a new official video from Right Thoughts, Right Words, Right Action. Black Book interviews CHVRCHES and The Alternate Side welcomes them for a session. Drowned In Sound gets a look at Summer Camp’s tools of the trade (read: their musical gear). The Huffington Post gets some EDM smack talk of out reigning Mercury Prize champ James Blake. A Music Blog, Yea? talks to drummer Rick McMurray of Ash. The Quietus revisits the first House Of Love album on the occasion of its 25th anniversary. Under The Radar talks to Mark Gardener and Andy Bell of Ride about the enduring legacy of their debut album Nowhere.